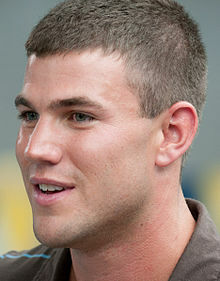 Austin Stowell (born December 24, 1984) is an American actor. He is known for his roles in Dolphin Tale, its sequel Dolphin Tale 2, Love and Honor (2013), Whiplash (2014), and as Francis Gary Powers in Steven Spielberg's Bridge of Spies (2015). Stowell was born as youngest of three boys in Kensington, Connecticut, where he was raised by his father, Robert, a retired steelworker, and his mother, Elizabeth, a schoolteacher. He graduated from Berlin High School in 2003 with the intention of pursuing a professional career in acting. Upon acceptance at the University of Connecticut in Storrs, Connecticut, he studied with the Department of Dramatic Arts, a division of the School of Fine Arts. He performed in several productions with the Connecticut Repertory Theatre, including Julius Caesar, It Can't Happen Here, and As You Like It. Stowell graduated with a Bachelor of Fine Arts in 2007. 2009 Secret Girlfriend Chad Episode: "You Get an Aquarium Girl"
2010 NCIS: Los Angeles PFC James Winston Episode: "Special Delivery"
^ "Austin Stowell". New York Times movies. All Movies. Retrieved February 13, 2015. ^ a b Lawrence, Olivia L. (November 14, 2010). "Stowell's star is rising". The Berlin Citizen. Berlin, Connecticut. Archived from the original on August 12, 2011. ^ Schreffler, Laura (September 30, 2010). "HOLLYHUNK! Rob Pattinson & Zac Efron, You've Got Competition — Meet Hollywood Hottie Austin Stowell!". Hollywood Life. ^ Cuttler, Andrea (22 October 2015). "Will 2015 Be Austin Stowell's Breakout Year? Steven Spielberg Thinks So". Vanity Fair. ^ Mayer, Robert (September 24, 2011). "Bright Lights, Big City...Berlin?". Berlin Patch. ^ Falcone, Amanda. ""Bridge of Spies" Actor Credits UConn for his Magnanimity". UCONN Magazine. Archived from the original on 2017-03-19. Retrieved March 18, 2017. This page was last edited on 16 April 2019, at 00:37 (UTC).